Does the government have a responsibility to protect innocent third parties from collateral damage when it seizes their property in the course of prosecuting alleged copyright infringement? That is the question a federal district court will consider next week in the latest skirmish in the legal battle between the U.S. government and Megaupload. Kyle Goodwin: EFF represents Mr. Goodwin, who owns a business called OhioSportsNet that covers local high school sporting events in sports-crazed Ohio. Mr. Goodwin and his producers used Megaupload to store and share video files of sports games; he also backed those files up on a personal hard drive. As luck would have it, that hard drive crashed a few days before the Megaupload shut down, leaving Mr. Goodwin with no access to the files he needs to run his business. Mr. Goodwin has asked the court to set up a process that would allow him, and others in the same boat, to access his paid Megaupload account and get those files back. Carpathia: Megaupload leased 1,103 servers from Carpathia, which contain approximately 25 petabytes of data (yes, 25 petabytes!). Carpathia still owns the servers and has not deleted the data, despite the government's claims that Carpathia has no obligation to maintain that data (more on that below). From the outset, Carpathia has worked to preserve users' data, but it claims that "it does not own and cannot access the data" and, as such, is not able to return it to its rightful owners. Because the government has frozen all of Megaupload's funds, Carpathia has been stuck eating the costs of maintaining those servers - approximately $9,000 a day. Carpathia has asked the court to allow it to repurpose the servers after allowing a brief period of access, to require another party to take control of the servers and pay Carpathia for them, or to require the parties to pay Carpathia to continue maintenance. MPAA: The MPAA claims that its members "are certain to own the copyrights in a substantial percentage of the infringing files" stored on Carpathia's servers. (Of course, the MPAA does not actually know what's on those servers, but it and its cohorts never been afraid to shoot first and investigate later). The MPAA has asked the court to prohibit transfer of Carpathia's servers to any third party. Indeed, the organization insists that even a court-mandated transfer violates copyright law, since the servers presumably contain at least some copyrighted material. You read that right: the MPAA claims that a transfer of the servers to a third party (whether or not that third party could or would access the files on it) would constitute an infringement of the copyrighted material on those servers (without regard to whether the underlying use was licensed or otherwise a fair use). The MPAA also expresses concern that Megaupload would obtain the servers and relaunch its service in a foreign jurisdiction. We think this unlikely. But, even so, the courts and the parties have the power to create a legal framework to ensure this doesn't happen. Finally, the MPAA claims that it has no plans to sue individual Megaupload customers. Yet without filing a lawsuit and making a case that those customers actually infringed copyrights, the MPAA - or the government - has no right to keep their data from them. So while we are glad that the MPAA won't be suing Megaupload customers, it is still outrageous that it wants to prevent those customers from accessing their property without due process. 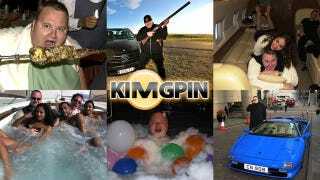 Megaupload: Megaupload has not filed a substantive brief yet, but we know that its attempts to work with the government to preserve the data on Carpathia's servers have not been successful. The Government: We had hoped the government would work with Mr. Goodwin, Carpathia, and the other parties to ensure that the innocent folks swept up in this mess were made whole again. Unfortunately, the government is doing its very best to avoid taking any responsibility in the matter. In its brief, the government argued that it has no obligation to help preserve the data on Carpathia's servers. Even more troubling, the government argued that the court has no power to order Carpathia or others to maintain or return the data (we think the government is wrong on this point, as we argued in our brief). To be clear, as part of its criminal case against Megaupload, the government has frozen all of Megaupload's funds. This means that Megaupload cannot pay Carpathia to turn the servers back on to allow its customers access to their data. When the government shut down Megaupload's business, seized its domains, and froze its funds, it also deprived Mr. Goodwin and others of their rightful property. The government should make those parties whole again by working with the court, Megaupload, and Carpathia to devise a process to get their data returned. The court will hear arguments next Friday. We will be there to make the case that Mr. Goodwin and others like him should get their files back. And we're hoping that whatever process the court adopts for doing that can serve as a model in future cases where the government seizes websites with third-party content on them, a tactic that we fear we will see all too often in the future. Republished with permission from the Electronic Frontier Foundation.